Railings were powder coated by us but not the posts. 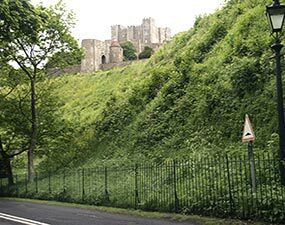 With our stripping, and blasting facilities, we were asked if we could strip some old fencing panels surrounding part of Dover Castle. In June 2005 over 130 panels had the pitted steel blasted back to grey metal, the Tri-Resin System (steel) was applied using RAL 9005 30%. This is three paint resins applied over a metal pre-treatment. The Tri-Resin System using the best architectural products available can also be applied over Galvanised Steel and Aluminium. 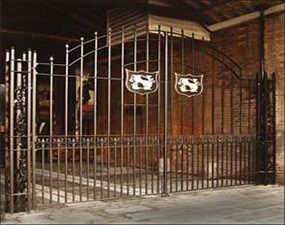 Shepherd Neame specially commissioned commemorative gate. The Tri-Resin™ System (steel) was chosen because the intricate detail of the vine leaves would have lost been during the galvanising process. Contracted by Blaze Neon, the Country's third largest sign maker. 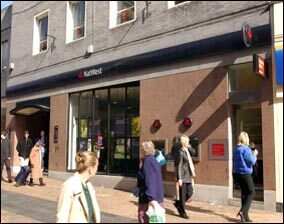 For three months during 2003, Nat West required all their branches to be resigned. Signs for 700 branches were powder coated using a specially manufactured blue metallic supplied by Dupont powders. Award winning construction. The Tri-Resin™ System (Aluminum) was used to powder coat window sun screens, louvers and general fittings. 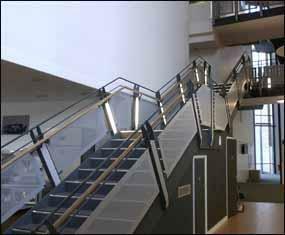 Inside Marlow Academy, Windridge Coatings powder coated hundreds of perforated panels that were used along side stairs and walkways. The handrails were brush painted. 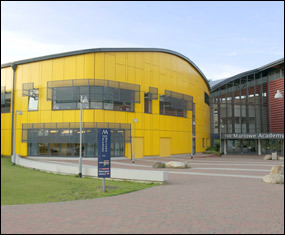 Wide view of main hall. 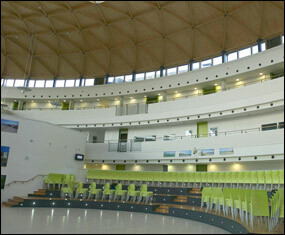 Although not clear to see in this picture above the black circles are individual perforated panels powder coated white. This football training equipment was powder coated using the Tri Resin™ system and then assembled on site. 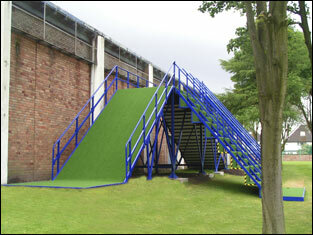 It is used for dribbling the ball up the slope, and used by a number of premier football clubs. The Doctors surgery is backing onto the cliffs at Cliftonville, Margate. 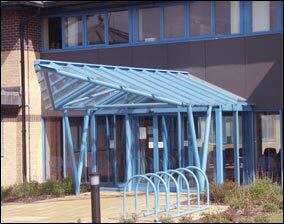 Powder coated over galvanised steel required the protection of the Tri-resin finish.